I’ve been working with Windows 8 for nearly one year now, and am slowly but surely moving into the mindset needed for the new OS’s take on desktop and tablet computing. I’ve been lucky enough to work with a Lenovo X220 Tablet with Windows 8 since last March (or just over 8 months now) and have learned alot about what makes for a positive tablet computing experience, thanks as much to my ownership of an iPad 2 as to my interaction with Windows 8 in a tablet (or touchscreen notebook) PC setting. I’ve also been reading lots of reviews of new Windows 8 tablet offerings including the MS Surface PC, the Kupa Ultranote, and most recently the Lenovo Yoga 13 convertible “ultrabook” unit. 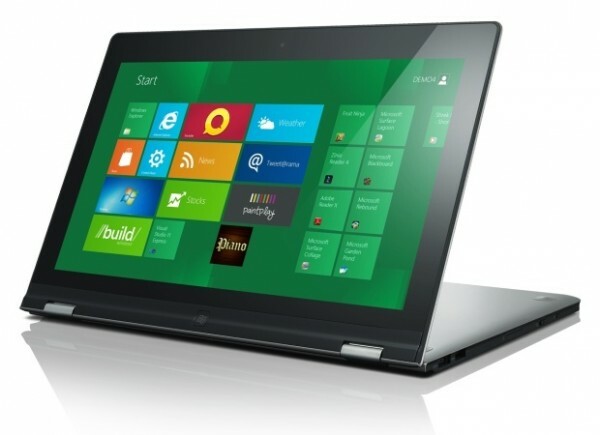 The Lenovo Yoga 13 has a lot to recommend it as a business Win8 convertible. In working daily with the Lenovo X220 Tablet, and playing with the MS Surface and the Samsung ATIV at the Microsoft Store, plus a brief groping session yesterday with my friend’s brand-new Yoga 13, I’ve formulated a “wish list” for features that I wish were commonplace for all Windows 8 tablets, with ratings for these various units for each such feature. The tp in the usable touch row stands for “touchpoints,” as in the number of simultaneous touches the display can sense at any given moment. The minimum Win8 requirement is 5, and all of the new tablets meet or exceed this requirement. My biggest concern is for weight, which really translates into usability in the hand. Even my iPad 2 at 1.625 pounds gets too heavy after a while (which, incidentally, helps explain the potential appeal of the iPad mini and other 7″ tablets), and all of these units are no lighter than that and both of the Lenovo models are significantly heavier (as I guess convertibles must be). The Lenovo keyboards are legendary and quite usable, even on the smaller layouts for these two units; the MS Surface Touch Cover is pretty minimal but surprisingly usable where the Type Cover is a good keyboard in keeping with other MS keyboard offerings; the Samsung keyboard isn’t bad, but its layout takes some getting used to. When it comes to computing horsepower, the bigger Lenovo units offer a great deal more capability (mobile but not ultra-low voltage i5 and i7 models are available), where the slim design of the true MS Surface and Samsung ATIV tablets require lighter-weight CPUs to keep weight and battery requirements manageable. Business users still have to be able to switch between the Modern style (formerly Metro) UI and the desktop to run business applications, so it’s really not yet an option to eschew the desktop entirely. This is the area where the Lenovo units jump ahead of their more svelte but perforce also more limited MS and Samsung counterparts. All the modern units do touch quite well (and even the X220 Tablet is usable, if not as quick or capable as the other tablets in the preceding table) but this is less important when running conventional business apps. By going through this exercise, my appreciation for the value of a slim but powerful tablet has jumped noticeably. I’m not sure the technology is completely there yet, but the industry is definitely making some great strides. By the time many businesses are really ready to take Windows 8 seriously — which is to say sometime in the next 18-36 months) it’s entirely possible that technology will rise to meet their needs. If a 1.5 pound unit with an attachable and usable keyboard can match today’s Lenovo units for computing horsepower, moving these units should be a slam-dunk proposition!